Vitolize Men’s Vitality Supplement contains all of the power of Forever Pr♂6® (not available any more), but now also includes more nutrients, more bioavailable nutrient forms and more powerful botanicals. Proprietary botanical blend including saw palmetto, pygeum and pumpkin seed. Proper nutrient balance for complete prostate support. Provides polyphenols equivalent to eating an entire pomegranate fruit. Although the exact age may vary, prostate health eventually becomes an important issue for all men. Vitolize Men's, combined with a healthy diet and exercise, offers a natural solution to support prostate health. Vitolize Men's is formulated with a proprietary blend of botanicals including saw palmetto , pygeum and pumpkin seed . Each of these botanicals has been used for centuries to support prostate health. 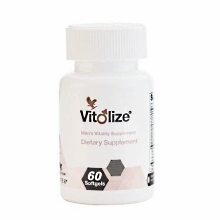 Vitolize Men's also includes a blend of nutrients specifically designed and balanced to support men’s health and promote healthy prostate function. Vitamins C, D, E, and B6 are all essential for a healthy prostate and are required for the production of hormones. These vitamins have been combined with the minerals selenium and zinc , which have been found to play a critical role in prostate health. Quercetin and lycopene have also been added in levels that are properly balanced with these critical nutrients to provide complete prostate support. Take two softgels Vitolize Men's daily as a dietary supplement.